Are you unemployed or earning less than before? Are you behind on your mortgage payments? Do you need to leave your home through a short sale or deed-in-lieu of foreclosure? The Greater Allen A.M.E. Cathedral wants to help you save your home! Free mortgage help. One day only! Come meet with your mortgage servicer face to face. 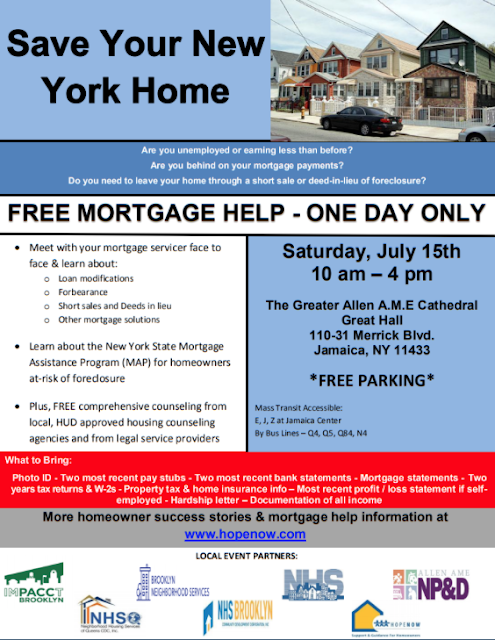 Learn about the New York State Mortgage Assistance Program. Receive free comprehensive counseling from local, HUD approved housing counseling agencies and from legal service providers. Labels: Do you need to leave your home through a short sale or deed-in-lieu of foreclosure? The Greater Allen A.M.E.